TORONTO, October 15, 2014 – Avanti Computer Systems Limited, a leading provider of Print MIS solutions, marks its 30th anniversary with a continued mission to deliver the world’s best Print MIS solution. In 1984, Dr. Richard Wallin was approached by two printing companies to develop an estimating system that would help run their business. Over the next three years, the product became the foundation of a Print Management Information System (MIS) known today as Avanti Classic. In 2004, the company was acquired by Stephen McWilliam, Patrick Bolan, and Peter Funnell, who have since tripled the company in size and maintained financial growth and stability ever since. Since its foundation, Avanti’s development team has continued to dedicate significant time and resources to pioneer Print MIS solutions that address the needs of North America’s leading commercial shops and Fortune 1000 in-plants. Today, the company is focused on providing comprehensive, fully integrated, and easy-to-use Print MIS software, exclusively for the Graphic Arts industry. “Although our software was originally designed for sheetfed and web printers, we quickly recognized the power of digital technology; in 1997 we developed, from the ground up, a digital estimating module”, continues Bolan. “Today’s business reality for our customers is that they have moved beyond just ‘ink on paper’. They need to manage not only litho and digital workflows, but also large format, fulfillment, data services, and direct mail. These were key design principles built into our Avanti Slingshot platform”. Avanti Slingshot, launched in 2013, is Avanti’s next-generation Print MIS. The browser-based solution features ease-of-use, business intelligence and analytics, advanced integration and automation to drive touchless workflows. Avanti Slingshot, which provides the flexibility to be deployed either in the cloud or on-premise, recently received a MUST SEE ‘EM award at the 2014 Graph Expo conference. 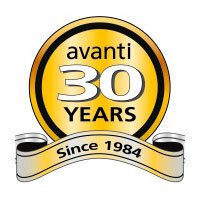 For 30 years Avanti has provided innovative, award-winning Print MIS solutions that help print-shops and marketing communication organizations automate all facets of their business and cultivate a more meaningful customer relationship. Avanti’s solutions are the most open in the industry; are JDF certified, fully integrated, and extend from web-to-print through to production and billing. www.avantisystems.com.